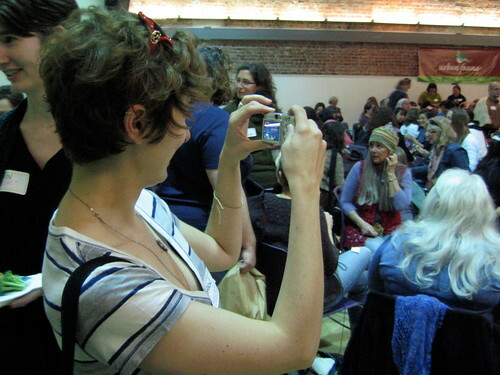 Last Sunday, Ravelers from all around the Bay Area gathered in the auditorium of the Mission District's Women's Building for food, friends, and general fiber-related fun. I always get really excited about these sorts of things, but the moment I actually get there, I realize, "Oh yeah...I'm actually kind of shy. So that's why my heart's beating all fast." But I forced myself inside anyhow, feeling better alongside two of my three real life knitting buds, and had a great time. After knitting for a little while, enjoying the refreshments (whoever brought the dolma ROCKS), and learning all about machine knitting (seriously, I want one), the free hand massages caught our eye. Brenda (bitterlich132 to the online world) went first. 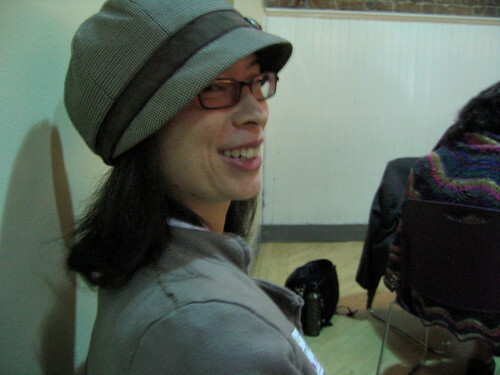 Erica (pui), who was also wearing an adorable hat, and I were waiting for our turns when I saw the Lady (theLady) walk in. And, I had a lot of fun chatting with San Francisco knitters Erin (nireknit) and Linda (LindaLovesLace) about my two favorite topics: knitting and the San Francisco Giants. I meant to take a photo of them, but I guess I was too busy rambling on about how Brian Wilson's scary pitching and Barry Zito's record (which I'm sure was fascinating ). 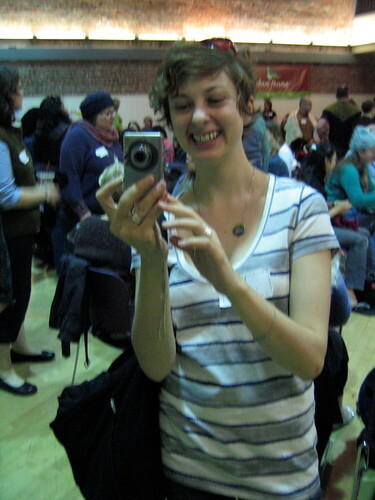 (This poor gal was frantically trying to pass out prizes to the assembling mob when I stopped her to take her photo). ...and a very cool black one, with one extra ruffle section. On our way out, we noticed a little bit of yarn graffiti just outside the venue. I'm not sure if it the tagging occurred during the event, prior to the event, or if it was completely unrelated, but I found it pretty cool. The organizers did a wonderful job with this event. I know these things take a lot of work to pull off, and I think everyone in attendance was greatly appreciative. 'Til next year! that looks like it was tonnes of fun!! Knit events are the best. I soo remember that mural! Love Kristen as well (jejune) - must have been a blast to meet your peeps (once you got over the sweats...) and see your Citrons! 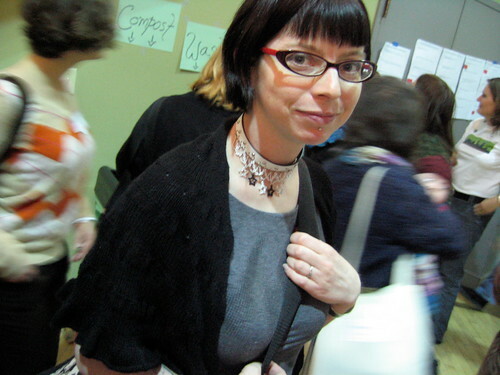 PS - will bug you again about further conquering your fear at RHINEBECK. aww, had I know, I would have been there. BTW do we have a date for 2010 Stitch and Pitch? Holy Cow! I was actually in the Bay Area this past weekend for my birthday!! I would have loved to attend!!! It has to be an awesome feeling to see so many people sporting the beautiful pattern you created! Oh my.. FREE hand massages?!?! now THAT should be at every knitting related gatherings! 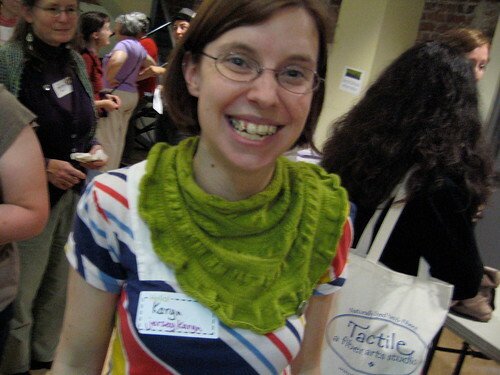 I agree about hand massages at all knit gatherings....I think next year I'm going to suggest it for the LYS tour in Seattle that's going on this weekend!! Lord knows that after working it I can probably use a foot massage! We had a whole tour bus full of knitters come to our little shop! It was so much fun!! It was lovely to meet you! I had so much fun, though I too was nervous about going. I missed out on the hand massages! Next time, I shall prioritize. Hiya! (I'm the one with the black citron, Erica pointed me to your blog). Ah, you beat me to the punch! (I haven't had a lot of punch to beat lately:-) It was SO cool to finally meet you in the material world. What fun! It must have been awesome to see all those Citrons in action. Looks like a great time, fast beating hearts at all! Great Jennifer. Love all the pics. I plan to start a Citron soon. 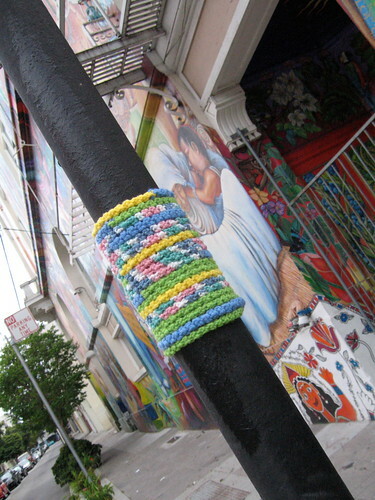 And very cute yarn graffiti, too. The world needs more of that!